Quote Configurator Answers the Question: How Much Does It Cost? Quote configurator technology helps you answer the inevitable question: how much does it cost? As much as we would like to believe our marketing message, it doesn’t cost; it pays, sooner or later we have to quote a price. The pricing question can come up at any time during the buy cycle, and it can even come up outside of a buy cycle. It can be a simple, casual request for a ballpark number, a price check to see if there is any point to continuing the discussion or a full-blown request for a quotation and proposal. Then, there is the always welcome, we just need a number for our comparison chart. This is typically driven by a need for column fodder for someone else’s proposal. Quote configurator technology will help you properly address all of these situations. It is important to take every request for pricing seriously. Every quote must be accurate or at least serve your tactical strategy in terms of the sale. No matter how casual the price request may sound, rest assured that the answer you give will be remembered. In addition,changing the quote downstream (particularly changing it in an upward direction) will be very difficult. But, quote configurator technology will increase your ability to successfully do this when required. Let look at several basic quotation scenarios. Anyone spending more than 10 minutes in sales has had this experience. A call is received, and a breathless voice nervously stammers around and finally manages to ask for a product’s “quick price.” You want to help, but heck, your product comes in 25 basic configurations and has 500 different optional add-on features. You can’t just toss out a number, you need more information. Your quote configurator provides you with the perfect excuse to be vague. You explain that in order to get an accurate price, you have to accurately configure the product to be delivered. If they can’t supply you with basic usage information, your answers should be constructed in an open-ended fashion using terms like our models start under fifty thousand or our base unit with no add-on options starts at between five and ten thousand depending on capacity. If you must provide this type of quote to your caller in writing, be sure that the conditional language accompanies the quote. A quote configurator makes this easy. The prices produced by configurators should be accompanied by product descriptions, and a decent pricing configurator does just that. It makes it obvious as to how much product is included for a specific price. Many times the best answer of all is to simply decline to put a number on the table unless the caller can share some information about their requirements. If they can’t share any information with you, why should you share anything with them? It’s not a matter of being paranoid, it’s a matter of trust. Business relationships must be built on trust. Pricing information has value unto itself; don’t just give it to anyone who calls. Many times (particularly during the tire-kicking phase of a real buy cycle or perhaps in a discussion with an existing customer) there will be a request for a ballpark quote. This is probably associated with a budget planning process, or maybe it comes within the context of a larger project. This is fine, and the motivation is genuine. However, you still have to be sure that your number comes with a fence around it. That fence needs to specify parts, assemblies, options included and other price-sensitive variables that can be clearly identified and quantified. Also, certain things that are not included such as shipping, implementation, training or customisation beyond the pale of selectable options should also be specified. With large-scale, complex deliverables in project-based manufacturing (especially and most critically with government-based projects), the need to clearly support earned value management processes is essential. This facilitates partial billing and revenue recognition for projects that clear specific milestones but are not complete or fully delivered as a whole. While this is not a specific function for quote configurators, the data these tools produce will document the expenditure to date within a given project. And, they will facilitate the construction of realistic estimates of cost for each milestone that is defined. For example, if you sell aircraft carriers, you may have separate, billable milestones for keel and hull completion, flight-deck completion, super structure island completion, internal systems and so forth. It’s a huge project that requires months or even years to complete. As each phase is wrapped up, you want to be able to clearly identify what has been completed, how much was spent and what was delivered. Quote configurator tools can document the data on parts, assemblies and pricing associated with each deliverable milestone. Manufacturing has been moving further and further away from the highly repetitive, high-volume model associated with manufacturing 1.0 toward the much more responsive and agile, on-demand, small-batch, one-off, highly customised/personalised capability. Manufacturing is fulfiling the “have it your way” promise of a certain famous hamburger vendor. However, the cost-estimating requirement for this mass personalisation or contract model is much more complicated than factoring in ketchup, pickles and secret sauce on the burger. For complex products, cost estimating starts with being able to identify accurate costs for as much of the offering as possible. Individual parts, assemblies and quantities can be identified. If you can identify the cost of 70% of the customised product, you are far closer to an accurate quote than identifying 20% of the costs. If you can push that known cost percentage higher still, to say 95%, then you almost certainly can build enough slack into your final quoted price to cover problems with the 5% that requires truly customised or one-off work. Those costs are contained, tracked and reported with quote-generator technology. 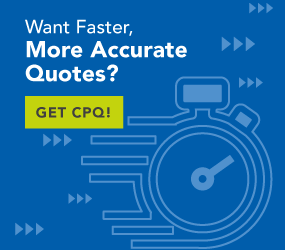 A quote generator helps you dramatically reduce the risk of quoting custom products. Hopefully, your buy cycle has resulted in an opportunity to present a formal proposal. Pricing accuracy is critical here. Accuracy means that the pricing aligns with your marketing strategy and correctly correlates with the list price. It also means that the numbers you are quoting in the context of your formal proposal are in agreement with the pricing you have submitted, discussed and agreed to in previous conversations. A smart guy once told me that the price of a product in the final proposal should never be a surprise. Quote configurator technology ensures that all of your previous quotes, ballparks and informational pricing discussions are in agreement or where variation is evident, the reasons for the variation are documented. The final proposal is not the place to make pricing errors or pricing corrections. This process should make the customer feel good about your ability to present information accurately and consistently. Quote it right the first time and every time. Quote configurator technology helps you answer the question, how much does it cost? quickly and correctly, time after time.